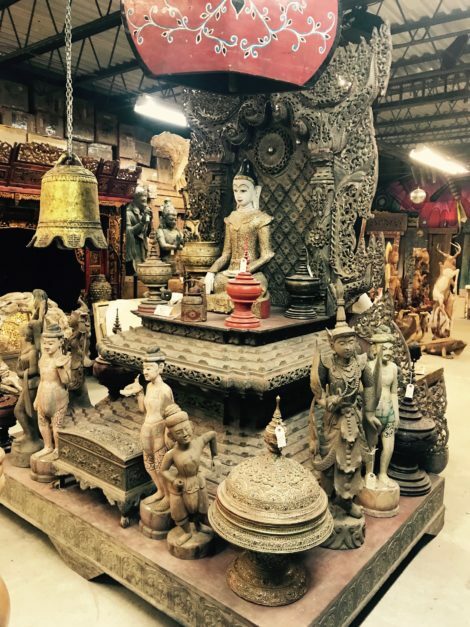 More than 25,000 pieces of Asian art line the shelves of Talbot's Asia Barong on Stockbridge Road in Great Barrington, Massachusetts. Great Barrington — Some people say they would do anything to be able to travel more. Thirty-five years ago, back when he was a biology student conducting research on the Great Barrier Reef, Bill Talbot, ran into a familiar problem: he wanted to continue traveling but was down to his last $300. Making what he calls “A series of the right mistakes,” he used the money to buy some local handmade artwork to take back home. From there he built up what would become the largest inventory of Pan Asiatic art, and built the largest Asian Art Megastore in America. The best part of all — the job required him to travel throughout Asia for five months out of the year. Today, when tourists and art collectors step foot into Talbot’s store, Asia Barong, they are likely to be awestruck. Immediately, customers leave Stockbridge Road in Great Barrington, and step into an entirely different world. Greeting them at the door are 10-foot-tall wooden statues of Buddha, display cases of Japanese Samurai swords, small Tibetan singing bowls, and thousands of other objects vying for attention. If the scene is overwhelming, that’s the point. During a conversation with The Edge in his office, Talbot reflected on his early days. He grew up in Stockbridge, attended Monument Mountain Regional High School and graduated from Evergreen State College in Washington with a degree in biology. Asia Barong is and has always been a family business throughout. Not only does Talbot’s daughter Hannah deal with customers and handle online sales, but the art they collect comes from dozens, if not hundreds, of families of craftsmen across Indonesia, India, China and Japan. The store is closed for five months each year starting in November. During this time, Bill and his family travel to their home in Indonesia, where they have made the first kiln in the country for handmade art. During his 35 years in business, Talbot has built up a vast network of craftsman and other artists from which he collects pieces from his store. The least expensive items he sells retail for only a dollar, while more expensive pieces can cost well into the thousands. Inevitably items break during shipping, but Asia Barong has a workshop in the back and Bill’s staff can repair almost anything. But for the few items beyond repair, there is a section near the workshop that offers them for a discounted price. The business has also changed since its inception. Asia Barong used to be a much larger wholesaler, supplying department stores like Bloomingdale’s and T.J. Max, as well as the highest-end galleries in the United States. While the store still sends artwork to roughly 1,500 stores throughout the country, the financial crisis in 2008 is a likely cause for the decline in their wholesale business. This fact seemed of little concern to Talbot, who pointed out that now that his children are out of college, he doesn’t need the extra cash from those sales to maintain his lifestyle of expansive travel. “Evergreen College in Oregon” –do you mean The Evergreen State College in Olympia, Washington? Jessica — thanks. You are right… editor error, and it’s been corrected. Always a treat to shop. Bill and Hannah can solve many interior and exterior design problems either from stock or on a made to order basis. I just like to wander around an recharge my battery there.